October is here, and we kicked it off with one of my favorite Halloween crafts. I have a soft spot for crafts using upcycled materials, and I prefer projects that are open ended with plenty of room for creativity. 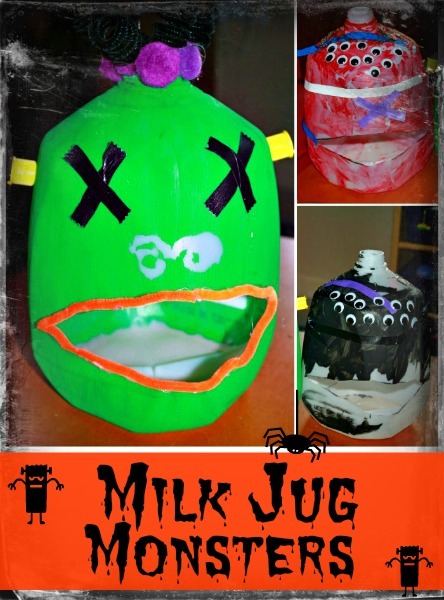 To make our Milk Jug Monsters I cleaned a few empty milk jugs with hot, soapy water. Once dry I used an exacto knife to slice an opening for the mouth. I asked the boys what color they wanted to paint their own monsters. J-Bug chose black, and JZ chose red. Note: We use both Colorations and Crayola paints for all of our projects. For some reason the red Colorations paint flaked off of the milk jug. The Crayola paint did not. 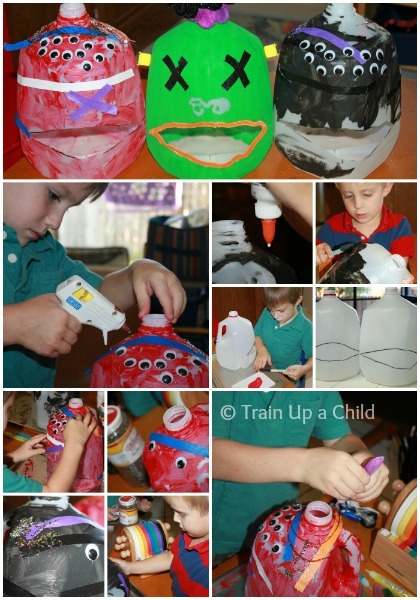 We painted the milk jugs before nap time to give them time to try before decorating. As you can see my boys thought their monsters needed a dozen or so eyes. JZ (5) adhered the googly eyes with a hot glue gun . They went to town with the craft tape and called it bandages. They played "doctor" for an hour, "healing" their monsters. It was really cute. I love when creative projects turn into imaginative play. For more ideas follow my Fall-Halloween-Thanksgiving board on Pinterest. Lovely, I would never guess at a milk bottle from the finished monster! These are COOOOOL! What a great way to recycle milk bottles. these are so cute! i love that they're made out of upcycled materials!! yay for hot glue guns! Wonderful - makes me want to go and buy some milk instead of getting them from the milk man. Thank you for linking up to Tuesday Tots this week and just to let you know that I will be featuring them this week on Rainy Day Mum.